The Minister of Environmental Protection and Agriculture, Levan Davitashvili hosted the Minister of Municipal Development and Environment of the State of Qatar, His Excellency Mohammed bin Abdullah Al Rumaihi and the Heads of Department of Agriculture, Livestock and International Cooperation of the State of Qatar. Mohammed bin Abdullah Al-Rumaihi paid a visit to Georgia for the first time. The overall goal of the visit was to get familiar with the investment potential of the country and further deepen trade and economic relations with Georgia. At the meeting, the sides have been focused on issues related to the transportation of livestock, lamb, goods, poultry meat, dry and fresh fruit, vegetable, honey exports. The participants drew their attention to the procedures to simplify transportation to export Georgian products to Qatar. 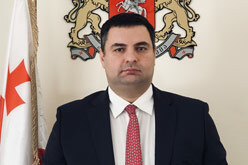 Levan Davitashvili stressed, that the Persian Gulf countries, including Qatar, are important trade partners for Georgia and have a great potential to further deepen trade and economic relations between the countries. The Minister of Environmental Protection and Agriculture of Georgia brought forward reforms implemented in Georgia to improve the food safety system and laboratory capacities, he also pointed out the progress achieved in the livestock disease management. The Minister provided guests with the main directions of the state environmental policy, including the concept of green economy development in the country. According to Levan Davitashvili, supporting green economy and sustainable development is one of the top priorities of the country. The Minister also noted, that the country has a great potential to develop ecotourism, agriculture and bio production. At the meeting, Mohammad bin Abdullah stated, that Qatar is interested in exporting Georgian products, including Georgian honey, because the demand for honey is increasing and the amount of production is not sufficient to meet its domestic demand in Qatar. Mohammed Bin Abdullah Al-Rumaihi noted, that in the nearest future, various companies from Qatar will visit Georgia to buy different types of agricultural products. "I am glad to visit Georgia. The Meeting with my Counterpart was very important. Georgian agricultural products have real potential to be exported not only in Qatar, but in other EU countries as well. Georgian products are attractive according their quality and taste "- said the Minister of Municipal Development and Environment of Qatar. Within the frame of the visit, the members of the Qatar delegation visited the exhibition of the production of enterprises, which were established under the state support projects. Levan Davitashvili hosted the delegation at the Jigaura experimental base of the Scientific Research Center of Agriculture as well. The guests visited companies "Barambo" and "Zedazeni" and got acquainted with their production process. At the end of the visit, Mohammed Bin Abdullah Al Rumaihi thanked Levan Davitashvili for his hospitality and invited his Counterpart Minister and the representatives of the business sector to the exhibition, which will be held in March 2019 in the State of Qatar.